It was just announced this week that on Wednesday, March 15th the Fed decided to raise rates again by a quarter percentage point. This is significant news because rates have been held at all-time lows over the past decade to compensate for the previous economic downturn. It is only since December of 2015 that the Fed has slowly begun to increase rates, and it doesn’t seem to be stopping anytime soon. Experts anticipate at least 2 more increases in this year alone. Not to panic, though; the Chairman of the Fed, Janet Yellen says this is in line with the current strengthening economy. So what does this mean for those who are in the housing hunt, or even those who were thinking about buying a home? In an article by Realtor.com, they explain “mortgage rates aren’t the same as short-term interest rates, which the Fed determines, but they tend to keep a parallel relationship and even anticipate the Fed’s actions. So the Fed’s actions can still have a big impact on the housing market.” Buyers may find that the price of their dream home seems even steeper when looking at the anticipated monthly mortgage payments. It will take discussions with a Mortgage Lender to see what options are available, and what decision is best for the Buyer in this market. Some may decide on an adjustable rate mortgage to keep costs low and look into refinancing at a later point, while others may decide to look at homes in a lower price-point which were overlooked before. As always, we recommend anyone considering buying a home to contact the real estate professionals qualified to advise them in this important life decision. Your Real Estate Agent and Lender can guide you and help ensure your goals are achievable. 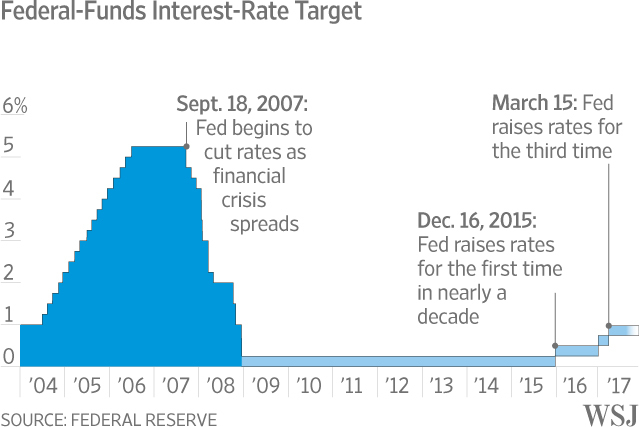 Below is a chart from the Wall Street Journal which depicts the rate changes in recent years. For more information, you can click here to read the article from Realtor.com.